Volvo and Uber have been collaborating for nearly 3 years. The ride-hailing company uses XC90s for its autonomous ride-hailing program (shown). Volvo has signed a framework agreement with Uber on a three-year deal to sell it up to 24,000 cars that will become part of the ride-sharing giant's first robotaxi fleet. 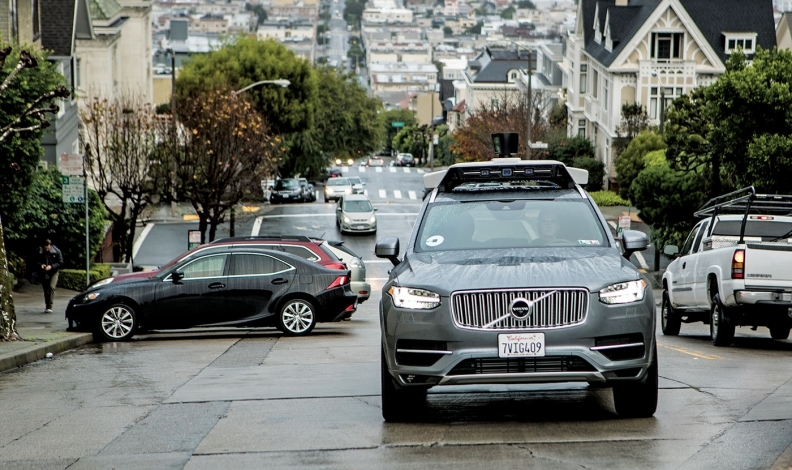 Volvo said it will supply Uber with XC90 SUVs that will have the core autonomous driving technologies that Uber needs to add its own self-driving features. "The automotive industry is being disrupted by technology and Volvo chooses to be an active part of that disruption," Volvo CEO Hakan Samuelsson said in a statement on Monday. "Our aim is to be the supplier of choice for AD [autonomous driving] ride-sharing service providers globally. Today's agreement with Uber is a primary example of that strategic direction." Uber will use the self-driving vehicles in the U.S., but the company declined to name the cities or reveal when they will start picking up customers. "It is sooner than most people think," Uber's head of automotive alliances, Jeff Miller, told Automotive News Europe. "Our objective is to be able to operate them without anyone behind the wheel in select cities and environments. The more common definition of that is Level 4." When asked when Uber will have an Level 5 autonomous car, Miller said: "I don’t know of anyone in the world who is saying they will be able to do Level 5, which is autonomous all the time everywhere in every use case." Volvo says the sales agreement runs from 2019 until 2021. The biggest single deal in Volvo's 90-year history gives it an early lead over rivals such as Daimler's Mercedes-Benz and BMW in a sector that Samuelsson expects will be crucial in the future. Other models using Volvo's scalable product architecture (SPA) include the S90 sedan, V90 station wagon and the automaker's global top-seller, the XC60 SUV. Uber's Miller said that the SPA architecture was a key factor in Volvo being chosen for the deal. “This was important because it was the most modern electrical architecture in the auto industry, which allowed us to integrate a lot of our systems within it in a more seamless fashion,” he said. Neither side put a value on the deal, but both companies expect it to be lucrative. “We wouldn't be making the level of investment that we are if we didn't think it was going to be an important part of our business going forward,” Miller said. The first example of the companies' collaboration came in in August 2016 when they announced a $300 million agreement for Volvo to provided 100 XC90s for the launch of Uber's first autonomous ride-hailing program in Pittsburgh. Since then, the companies have been working together on the hardware side of self-driving systems, which includes technology such as redundant braking. When asked where Uber will do the additional work needed to make its vehicles capable of driving themselves, Miller said it hasn't been decided. “Right now, we are doing it in smaller volumes in Pittsburgh, but we are exploring a number of different options for the scale manufacturing,” he said. Samuelsson said the base XC90s that Volvo will provide to Uber will come from the automaker's plant in Torslanda, near Gothenburg, Sweden. He said Uber could also get cars from Volvo's U.S. factory near Charleston, South Carolina, once the next-generation XC90 is added to the plant in 2021. The Volvo boss said that the collaboration with Uber will be crucial to meeting its own autonomous car goal. “Working together with the Uber engineers is very beneficial for our engineers,” he said. “I think it will help us develop our Level 4 car.” Volvo aims to offer its first fully autonomous car by 2021. Volvo has stood by Uber despite some hiccups including a high-profile accident in March that led to Uber temporarily shutting down its self-driving testing program. The Uber-modified XC90 crashed in Tempe, Arizona. Police in Tempe say the self-driving SUV was obeying the law. The driver in the other car didn’t yield and was cited for a moving violation after crash.